*It was supposed to have been a week of celebration for WBIX (1060 Natick), as the eastern MASSACHUSETTS business-talk station celebrated its new 24-hour status with a gala party at the Boston Harbor Hotel. That was Wednesday night. By Sunday morning, the station's future was in doubt, with owner Brad Bleidt under federal investigation for having allegedly stolen money from clients of his financial-management firm to cover the tens of millions of dollars being spent to build WBIX's night signal and to keep the upstart station afloat. Bleidt is reportedly hospitalized as he recovers from the suicide attempt, and his personal assets, as well as the assets of his company, Allocation Plus Asset Management, have been frozen by court order while the SEC pursues its investigation. At last accounting, the FCC's auction of new FM channels still had the 94.3 class A allocation at Brewster near the top of the list. "GBH Telecommunications," which is apparently a partnership of Boston's WGBH and the money folks at Public Radio Capital, is holding steady with a $3.927 million bid for the vacant channel at press time. We're likely to know by next week's issue who the winning bidder will be. Out west, WFCR (88.5 Amherst) turned on its IBOC digital signal Wednesday, with donors Joseph and Dorothy Gavin of Amherst flipping the switch on the new transmitter. On the TV front, Saving Private Ryan was pre-empted for Boston and much of the rest of New England on Veterans Day, thanks to concerns about FCC fines for the copious use of, er, adult language in the early minutes of the movie. Hearst-Argyle's WCVB (Channel 5) in Boston, WMUR (Channel 9) in Manchester, NEW HAMPSHIRE and WMTW (Channel 8) in Poland Spring, MAINE pre-empted the movie, as did Young's WTEN (Channel 10) in Albany and its satellite station WCDC (Channel 19) in Adams, Mass. *More news from the NEW YORK state capital: the all-Christmas music bandwagon has gotten rolling, and it started at WZMR (104.9 Altamont). "Love 104.9" put its usual blend of smooth jazz and classic soul on hold last week in favor of holiday tunes, though it promises the old format will be back on December 26. Downstate, there's a new PD at Emmis' WQHT (97.1 New York). John Dimick is inbound to "Hot 97" from the Jefferson-Pilot cluster in San Diego, where he was director of programming and operations. Longtime Hot PD Tracy Cloherty will stick around in a consulting role. It's a two-channel future for WOR (710 New York): the crack engineering team of Tom Ray and Kerry Richards flipped the switch last Monday to take the station's IBOC digital signal into stereo for the first time. The move comes with a complete overhaul of the studio facilities and the station's on-air imaging into stereo; WOR even needed to replace its old time-tone generator as part of the changes, which Tom says are designed to get everyone thinking in stereo as WOR prepares to move to its new Wall Street home next year. Say goodbye to the "Westchester" market: Arbitron has stopped issuing a separate book for that radio market, though all its statistics remain available through breakouts from the larger "New York" market. A veteran Rochester voice is expanding his reach to the west. WCMF (96.5 Rochester) morning man Brother Wease will soon be heard on Infinity sister station WBUF (92.9 Buffalo), doing a 10:30 AM to 1 PM shift that will be partly original for Buffalo and partly a "best-of" the Rochester morning show. This isn't Wease's first attempt to expand his show beyond its home base - he was heard on weekends on New York's WNEW (102.7) during its talk era - but this one may turn out to be longer-lasting, especially when you consider that WBUF will be losing its current morning host, Howard Stern, in just a year's time, if not sooner. Best wishes to WGMC (90.1 Greece) station manager Jason Crane, who signs off his afternoon shift for the last time this Friday. Rob Linton has been named as Jason's replacement; he comes over from crosstown commercial news-talker WHAM (1180). And a correction from last week's NERW: WFLR-FM (95.9 Dundee) has not yet been granted a move to 95.5; that's still a pending application, and we hear it's being held up by Canadian concurrence issues. *The final shoes have dropped in that southern NEW JERSEY format shuffle, as Press Communications began programming its "Breeze" soft AC format on WKOE (106.3 Ocean City) midweek last week, with the simulcast of Millennium's "New Jersey 101.5" (WKXW-FM 101.5 Trenton) moving to WIXM (97.3 Millville). The new "Breeze" at 106.3 completes a Jersey Shore-blanketing trimulcast with WWZY (107.1 Long Branch) and WBHX (99.7 Beach Haven), and there's already a rumor swirling that Press will swap formats between WWZY and modern rock "G106-3" WHTG-FM (106.3 Eatontown) to put Breeze on both of the 106.3 signals it now controls. Meanwhile at the top of the dial, Radio One has begun testing the signal of its new 107.9. We hear that the tests are still using the old WSNJ-FM calls (creating the rare legal ID of "WSNJ-FM Pennsauken," and yes, we already have it on tape for the collection) and not the new WPPZ calls. Over in Pittsburgh, Sheridan's launching a new format on its new simulcast of WAMO (860 Millvale) and WJJJ (107.1 Greensburg), as they segue to "adult urban" under the new name of "Majic 107." A talk-radio shakeup today (Monday): Rush Limbaugh moves from KDKA (1020) to WPGB (104.7), Bill O'Reilly moves from WPTT (1360 McKeesport) to KDKA (giving Fred Honsberger the extra hour from 2-3 vacated by Limbaugh), and Neal Boortz moves from WPGB to the 1-3 PM slot on WPTT. All clear? And up there north of Johnstown, WRDD (1580 Ebensburg) and WNCC (950 Barnesboro) flip from oldies to Business Talk Radio. *In CANADA, the CRTC puts out calls for applications for new radio stations in Woodstock, Ontario and for TV stations in the Niagara region. The radio applications are due January 7, with TV due a month later. Toronto's newest radio station, Spanish religious CHSL (1610), will make its official debut next Sunday (Nov. 21), with a celebration party that will start at 12:30 PM at the station's home, the San Lorenzo parish church at 2981 Dufferin St. (one block south of Lawrence). The events will include a Mass at 12:30, the blessing of the tower and studio at 2:30 PM, and a 3 PM press conference. And CKDO (1350 Oshawa ON) has had its application to put an FM relay on 107.7 reinstated after Industry Canada ruled that the 107.7 frequency couldn't be used in Barrie without interfering with aviation communications. CKMB (107.5 Barrie) had hoped to move to 107.7 and increase power, but now that move is off, while CKDO's proposal is back on the CRTC's agenda. *You're less than two months away from 2005 - so why haven't you ordered your Tower Site Calendar 2005 yet? 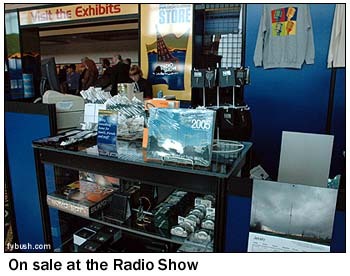 It's now for sale, among other outlets, at the NAB Store - yup, that was the 2005 edition on the counter in San Diego - as well as being on the racks at Universal Radio in Ohio. And we're pretty sure the cover of the Tower Site Calendar 2006 has now been photographed - but we won't spoil the surprise just yet, will we? We're holding the price from last year, notwithstanding increases in printing costs and PayPal fees - just $16 postpaid ($17.32 including sales tax to New York addresses). And as always, it's free with your $60 or higher subscription to NorthEast Radio Watch/fybush.com. You can use PayPal, below, or send your check or money order, payable to Scott Fybush, to 92 Bonnie Brae Avenue, Rochester NY 14618. So why wait until the last minute? Why make us wait until the last minute? Why not let me park my car back in the garage where it belongs? Buy your calendars now, won't you? NorthEast Radio Watch is made possible by the generous contributions of our regular readers. If you enjoy NERW, please click here to learn how you can help make continued publication possible. NERW is copyright 2004 by Scott Fybush.